Graphic illustration and forecast of Tropical Storm Isaac as at September 10, 2018. 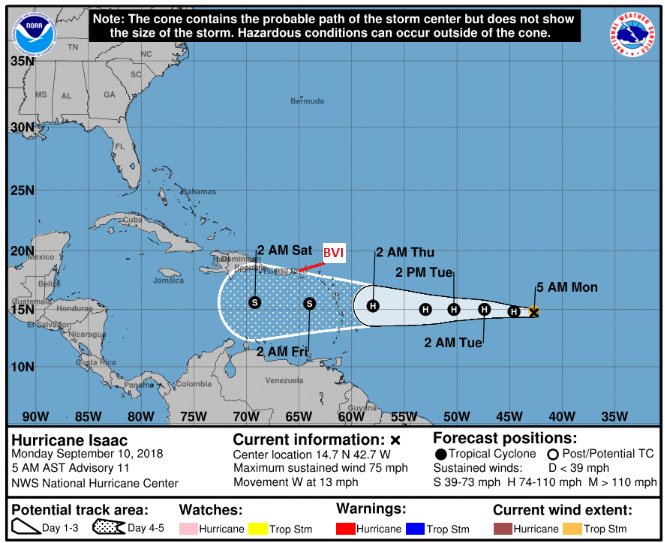 Hurricane Isaac is forecast to begin affecting the British Virgin Islands on Wednesday and will produce greater impacts on Thursday (September 13), the Department of Disaster Management (DDM) has said. “It is predicted to pass approximately 206 miles south of the British Virgin Islands as a strong tropical storm,” the DDM said. “The BVI may see an increase in cloudiness with a high chance of showers from Wednesday. Seas as high seven to 10 feet are also possible,” added the DDM, which also noted that weather predictions are subject to change. The weather system was located approximately 1469 miles east-southeast of the territory around 5 o’clock Monday morning. It continues to move westerly with maximum sustained winds of 75 miles per hour. Persons are still being urged to continue preparations as they brace for the storm. Better nothing. How many of you want to deal with your insurance thieves again. @pay, how in the world? You know what? Never mind. Too bad. No hope for you. If you have family living in North Carolina, South Carolina and Virginia,they issued a State Of Emergency. The hurricane is going to hit landfall by Thursday.Here in Maryland they also issued a State of emergency.I live near the water which is rising so I made the decission to take my kids and pet to a hotel in the city. It is people with the mentality of “pay” that gets government workers a bad name. Why should government be expected to pay you to prepare your own property for a storm. Next you will want a minister to come hold an umbrella over your head if you lose your roof and it is raining. It is time people start to take responsibility for their own lives and stop expecting government to do everything. Government spends tax payers money , not their own money . If you want to live in a place where government does everything then go live in Venezuela and see what life is like when the socialists run out of other people’s money to spend .